The wait is over — and now a new wait for a little one begins! 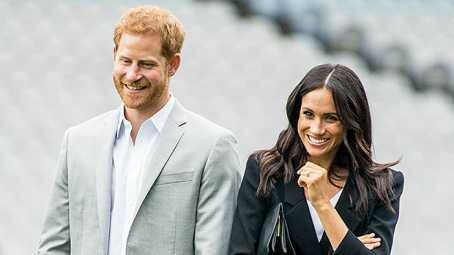 Meghan has finally confirmed her pregnancy with Prince Harry, which we’ve been anxiously awaiting since the two tied the knot, and we have all the exciting details here!This is not a drill! After months of speculation and rumors we really wanted to believe, the news we’ve been waiting for is finally here. Meghan Markle, 36, and Prince Harry, 33, have their first baby on the way, which is so majorly exciting that we don’t even know what to do with ourselves. The pregnancy was confirmed on Oct. 15 via the Royal Family and, of course, sent the whole world into a frenzy. Ever since we saw how lovingly they looked at each other at their gorgeous May wedding, we’ve been waiting to see Meghan show up to a royal event sporting a baby bump. Meghan’s mom, Doria Ragland, “is very happy about this lovely news and she looks forward to welcoming her first grandchild,” the palace confirmed in a statement. However, there was no comment regarding whether or not Meghan’s estranged father,Thomas Markle, had been told about the exciting news. Meanwhile, “The Queen, Duke of Edinburgh, Prince of Wales, Duchess of Cornwall, and Duke and Duchess of Cambridge are delighted for the couple and were able to congratulate them on Friday at [Princess Eugenie’s] wedding in person,” the palace added. These two are going to be the best mom and dad — and we already know Kate Middleton and Prince William will swoop right in if they need any help. Those two have parenting on lock! What we don't know is what Meghan and Harry are going to name their little one. But a source close to the soon-to-be momma told Hollywoodlife EXCLUSIVELY, “Harry’s so far removed from the throne that there’s not the same kind of pressure to have a super traditional name, so apparently he suggested they go bold and modern. But Meghan’s quite fascinated by medieval English history, the Knights of the Round Table and that sort of thing, so she’s been looking at names from way back.”And the suspense rises! Whether they’ll choose to go traditional like Prince George,Princess Charlotte and Prince Louis — or follow in Kim Kardashian and Kanye West‘s more eccentric footsteps — is still a mystery. So while we try and wrap our brains around this exciting news, all we can say is congratulations! Three cheers to this growing family!